resolution PDF documentation within the graphical user interface or in batch mode. as PCB Designers, PCB suppliers, Assemblers, Designers and Testers. The user interface is customizable, personalized hot-keys allow users full interface control. Standard Windows interface; Menus, toolbars, and other interface features follow Windows standards. Viewplot delivers performance and features unmatched in the industry. from the input data, even from a "View all". using a bitmap view, this will result in a spaghetti look. Viewplot is designed to reduce manufacturing production expenses and enhance productivity. Verification capabilities ensure efficient workflow to manufacturing equipment. Viewplot runs on a desktop or laptop Windows PC. High resolution PDF output (No Bitmap screen dump) ! Panalize single boards to a panel (Step & Repeat). 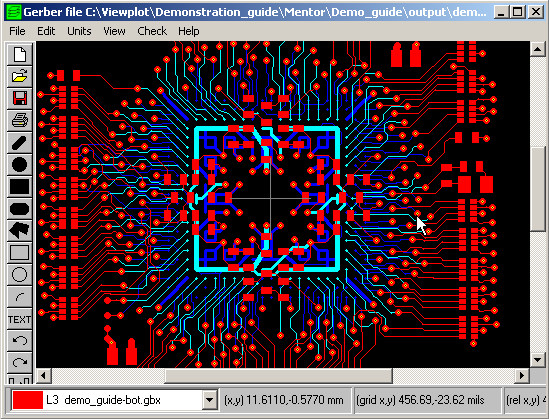 Mentor Graphics Board Station users can integrate Viewplot within Fablink and Librarian. On top of that we also provide a DXF to Mentor Board-Station Board-outline conversion. Export to the Board Station file format, that will draw the board-outline (including drill holes). electronics design and or manufacturing data. By combining all the input files needed for manufacturing or (re)view in one complete Viewplot Job file. Viewplot easily transfers work from design to colleagues for review or to fabrication. The Viewer includes the same functionality as the licensed version. except saving output data. For saving a valid license key is required. Saving in the internal Viewplot format (Job file) is part of the Viewer !